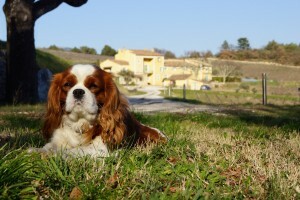 Our Cavalier King Charles, Farlow, asked to be the only one on the domain. Therefore animals are not accepted. Check-in takes place from 5.30 p.m. to 7.30 p.m.
Check-out takes place before 10.30 a.m at the latest. A deposit corresponding to 30% of the total cost of your stay will be required to complete the booking. Payment via Bank Transfer. This deposit will be returned to you for any cancellation confirmed by mail at least 15 days before the scheduled date of your stay. In case of cancellation less than 15 days before your stay the deposit will be retained. On your arrival you will be asked to pay the remainder of the cost of your stay. Payment : cash in Euro or Credit Card. Each early departure will be considered as a cancellation and charged of the total amount of your booking.